Kazymerchyk is the founder of DIM Cinema, the Pacific Cinémathequè’s monthly experimental film event. She estimates that in the two years the program has been running, DIM Cinema has built up a steady attendance of 20 to 40 people per screening—more if the event is screening an international work. She has noticed that in Canada’s contemporary arts climate, it is more common that film fanatics will recognize an international filmmaker over a Canadian filmmaker, but that hasn’t diminished her resolve to screen important Canadian cinema. Third Monday of every month. Against the entertainment mega-industry of the United States and the cultural legacies of European countries, Canada’s film industry can’t quite compare—especially after drastic cuts to government funding for the arts. Cinémathequès, she explains, along with cultural institutions such as the Canada Council for the Arts and the National Film Board, were founded in the 1960s to support creation of Canadian culture, and by extension, the core of the Canadian identity. “I started this because I had seen there really wasn’t an experimental cinema centre after the Blinding Light shut down. For me, I really just wanted to see a space where it could happen,” she says. The Blinding Light!! was an underground cinema in Vancouver that, like many artist-run centres, thrived for only five short years. “In the city of no space, how can we use the spaces that we have?” asks Kazymerchyk. 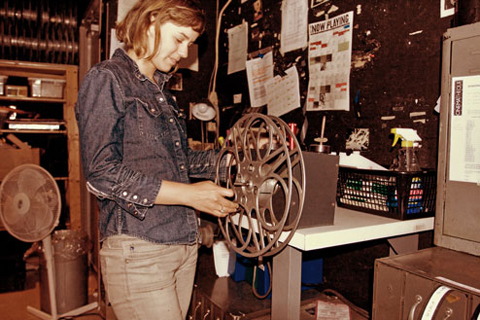 Herself a filmmaker as well as a staff member at VIVO, Kazymerchyk can count dozens of venue closures that have impacted the arts community here and prevent any real, continued cultural development in the city. “It’s not how much money you are making or how many people are going that’s determining its worth,” she says of DIM Cinema, and more broadly, of artistic initiatives in Vancouver. “It’s the committed community of people who are in a deep engagement with the conversation. Amy Lynn Kazymerchyk of DIM Cinema.